← Homosexuality v. homophobia, which is criminal? As you know, this year (2012) marked the launch of the AfricLaw blog by the Centre for Human Rights and the Institute for International and Comparative Law in Africa, University of Pretoria. AfricLaw would like to thank you for your support in its first year of operation, for regularly visiting and commenting on posts on this blog. Equally, AfricLaw would like to thank all contributors for trusting AfricLaw to publish their invaluable contribution to discussions on the rule and role of law in Africa, mainly as regards human rights. It remains AfricLaw’s mission to provide a platform for discussion around issues on the rule and role of law in Africa and to further strengthen African capacity in the field of law, through informed and engaged discussion. 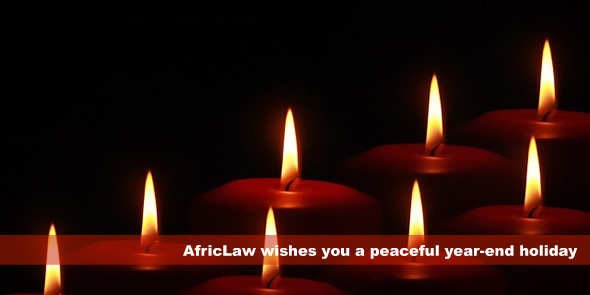 We trust you will continue to support AfricLaw in the future and that you will also share ideas from the blog with colleagues and friends. We furthermore hope that you extend an invitation for further contributions to students, academics, researchers, international and national civil servants, legislators and politicians, legal practitioners and judges you may know. Greeting and a lovely year ahead to us all.